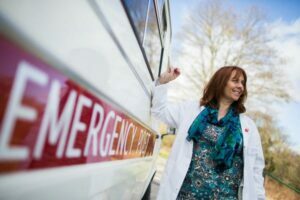 I interviewed ‘The Emergency Poet’ Deborah Alma about how she brings poetry to people, taking as her model a doctor’s consultation. Deborah is the editor of Emergency Poet – an anti-stress poetry anthology; The Everyday Poet – poems to live by; and #MeToo – an anthology rallying against sexual assault and harassment. Her writing residencies include the NHS conference in 2013 on Mental Health and Wellbeing, Southmead Hospital in Bristol and the Arvon Foundation in 2014. Deborah has used poetry with people with dementia and has been lead writer for Spark Young Writers for Writing West Midlands. 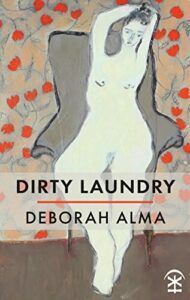 Her own first collection Dirty Laundry was published by Nine Arches Press in 2018. Leslie: How would you characterise your own poetic persona as a poetry activist, research fellow at Keele University, the author of Dirty Laundry and a number of anthologies? Deborah: It’s very true that I do a lot of varied things in and around the world of poetry – those you list in the question as well as some years of working with people with dementia as well as with other vulnerable groups using poetry to assist communication. I also teach at Keele. I suppose I would call myself a poetry evangelist. It comes from growing up in a North London council estate and attending a posh grammar school; feeling like I had a foot in both worlds and didn’t belong in either. I want to take poetry out from the academy and the learned journals and take it to people that might not encounter good quality and intelligent poetry otherwise. Leslie: Can you describe how you present when you turn up in your 1970s ambulance to offer consultations and prescribe poems as cures for various maladies? 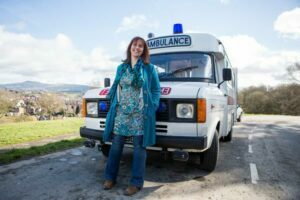 Deborah: I travel in my 1970’s ambulance to festivals, libraries, schools, city centres, conferences; anywhere where I’m invited. Dressed in a doctor’s white coat and stethoscope and accompanied either by Nurse Verse or a Poemedic, this crack medical team administer poetry. We do it either through a ten-minute one-to-one consultation on the stretcher in the back, or via the Poetry Pharmacy – where there are bottles of pills containing poems for various ailments… from such things as Anxiety, Internet Addiction, Empty Nest Syndrome, to Poetry Viagra and pills for Unrequited Love. It looks like a piece of street theatre, but it has more in common with gypsy fortune-telling caravans of the past. It’s part theatre, but the conversations are real and intimate, and the poetry is really good poetry and it’s always free at point of delivery, like the NHS. Leslie: Would you like to expand on your John Andrew Denny quote* and your use of medical metaphors for poetry such as ‘Poetry on prescription’ and ‘emergency poet’? ‘Patients’ come in to the back of the ambulance, I give them close attention, but only a little eye contact, as I’m listening and valuing their words, writing them down. I ask a series of non-invasive, intimate and lovely questions. It is all about that individual; what books they loved as a child, where they would go to be peaceful, how they relax, and if they care for themselves in that still quiet space in themselves. Then they are open and receptive to the last question: is there an emotional condition that you’re aware of…? I have my 300 odd poems ready-printed and after listening carefully I pull one out from my doctor’s bag, write their name at the top and tell them how and when they should take it. So I’ll suggest they couple it with a glass of wine, with a cup of tea in a garden, or on a park bench listening to birdsong, and point out a few relevant lines of the poem I have chosen. From the start I was overwhelmed by people’s responses, not just to the idea itself and to the theatre, but to the ‘therapy’ session. There is a magical combination of things when someone comes in: they put their feet up, sounds outside are hushed; it is a non-threatening intimate space, (I like that too as a metaphor for the poem itself). I saw just how poetry could do so much; to speak intimately as though from one person to another, to change a mood, to challenge, to inspire, to act as blessing or prayer. And after listening to thousands of ‘patients’ over the years, I have learnt that I am quite good at it, and that it has some value. I have been invited to do the work, or something tailor-made, in hospitals and in hospices, with vulnerable groups: people with sight loss, a loneliness charity, people with learning difficulties, survivors of domestic violence and others. 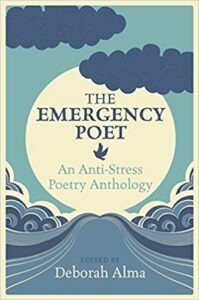 Leslie: What were the key considerations and processes that went into editing The Emergency Poet-an anti-stress poetry anthology, The Everyday Poet-Poems to Live By and the #MeToo poetry anthologies? Deborah: I really enjoyed putting these poetry anthologies together. I was delighted to be approached by the mass market publisher Michael O’Mara to put together the first one based on poems that I most often prescribed. Because of the high costs of obtaining permissions, particularly for US poets, I struggled to keep the volume from containing too much of the work of dead white men. I approached a few poet friends for permission to use their poems, in exchange for a copy of the book and my eternal gratitude, and their work has lifted the book out of being a predictable collection of poems. The book was so successful (to date over 30,000 copies sold) that the publisher commissioned a second anthology, which I think I prefer to the first. In October 2017, while we were all listening to those many conversations that started in the wake of the Harvey Weinstein allegations, I remember being surprised to hear male news reporters being genuinely shocked when they asked women politicians, actors and media colleagues if they’d ever experienced anything similar, and being told ‘Of course’ and ‘Yes, many times’ and ‘Every woman’. It prompted me to ask my women friends to add their name on my Facebook page if they hadn’t experienced any form of sexual harassment in their lives and I was surprised to find that of the 200 women that started to share some of their stories , two or three were able to say that it had never happened to them. My surprise was not that there were so few, but that there were any at all. I wasn’t even aware of the #MeToo thing happening over on Twitter at that point, but as it turned out, very many women were sharing their stories. Many of the women on that thread were fellow poets and I knew that some of them had written about domestic and sexual abuse and it occurred to me to collect some of these stories as a poetry anthology. It’s been an extraordinary book of which I am enormously proud. 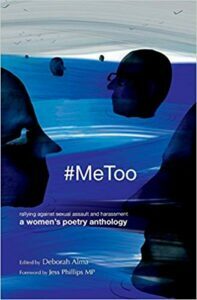 A collective/cooperative work with all the poems from 80 poets, the artwork, cover, editing and publishing donated by women to support the project and to raise funds for Women’s Aid. We were proud to win the Saboteur Best Anthology of 2018 Award and events and readings from the book have happened and are still happening all over the country. It’s been featured at numerous festivals and on Radio 4’s Front Row and Woman’s Hour. Leslie: How do you go about teaching creative writing to young people? Deborah: This is an enormous question; but my underlying motive is one of helping them to make the art their own, and not to think it difficult or beyond their understanding. I teach so that the experience is playful, experimental and not intimidating. Leslie How do you work with people with dementia and at the end of their lives? Deborah: The work I do was pioneered in this country by my mentor and friend John Killick, with whom I worked for a few years in a project funded by The Courtyard Theatre in Hereford in association with Ledbury Poetry Festival. Four poets were trained by John to work in care settings to sit alongside people with dementia and to simply listen. We worked both with people in groups and also one to one. The idea involves listening carefully while chatting to someone with dementia; the work involves writing down their words and shaping them into a poem which is then given back to the person on the next visit. Their words are used without adding or altering them in any way, although not everything is used and it may be differently ordered. With the individual’s permission these poems may then be shared further with family or with care staff, or even more widely in a book or performance. It’s often been very useful to read these poems to the care staff as this can give them an insight into the lives and experiences of people in their care that they had not the time or the opportunity to discover. Sometimes the words come very slowly and need to be patched together to make a narrative. ‘Poems preserve language in the feeling form’ John Killick. I’ve also worked in a hospice making poems of leave-taking. Leslie: What have been your most successful approaches to being writer in residence at the Arvon Trust and the NHS Conference in Mental Health & Wellbeing? Deborah: I think, using the developed skills of listening and reflecting back. In both these residencies I made ‘found’ poems from the words of others. 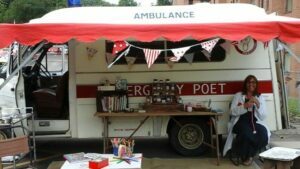 The NHS conference was also prescribing poetry from the ambulance and running a Writing for Wellbeing workshop. Here’s a poem made from the words of key-note speakers at the Psychologists and Psychological Therapists’ Conference 2017 .
a shared moment in the here and now. the boundary between self and the other. or in pain, or out of control. in all of us. So sometimes, yes, get your train home early. But sometimes stick around to the end. Deborah: My partner the poet James Sheard and I have a grand plan to open a Poetry Pharmacy, which hopefully one day will be a centre for poetry; a community arts space, a poetry book and gift shop, all with a café and performance and workshop spaces. There will also be a consulting room building on the success of the Emergency Poet’s consultations. It will be also aim to be a centre for writing and well-being; and all set in a magical building in the beautiful borders town of Bishop’s Castle. No 36 High Street, Bishop’s Castle once an iron-mongers, and still retains all the original Edwardian shop-fitting and oak counter and shelving. We aim to preserve the building for future generations and restore it to its former glory. Next week Chris Ogle talks about how Link4Growth, a not-for-profit networking organisation, supports personal, community and business growth. Previous PostWHAT’S THE TRUTH BEHIND HISTORICAL FICTION? Such a great idea and a worthy resource to people. Congratulation and good luck to Deborah on all her emergency work.